The Order of the Bath is a chivalric order founded by King George I in 1725 and named after the ritual washing included in the medieval conferment of knighthood. The Collar of the Order - the large chain - is made of gold with alternating imperial crowns and flower clusters, separated by white knots. The flower clusters include roses for England, thistles for Scotland, and shamrocks for Ireland. The Badge is suspended from the front center of the collar; it includes the Order's motto of Tria Juncta in uno ("Three joined in one") as well as Ich Dien ("I Serve") on a white enameled Maltese cross. The collar and badge are worn over the Mantle, the robes worn for certain ceremonial occasions. The Mantle is made of crimson satin with a white taffeta lining, cord and tassels at the closure, and large white bows on the shoulders. The Mantle's left side includes a large representation of the Order's star. The Queen, as Sovereign of the Order, has a Mantle with a long train. 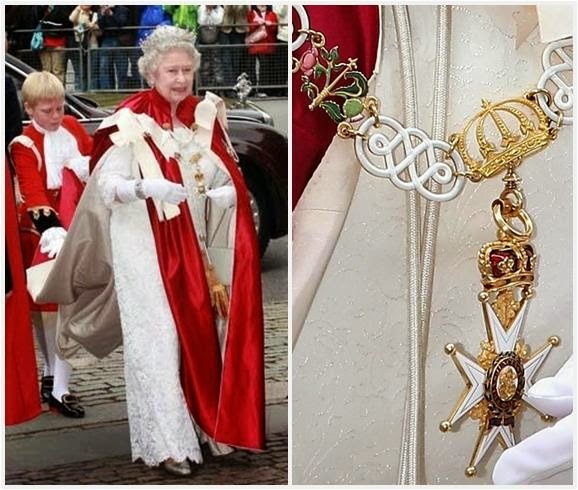 She uses the Collar, Badge, and Mantle when she attends the Order's service at Westminster Abbey; the service is held every four years, and she attends only alternate services.